U.S. Energy Secretary Steven Chu, speaking at an Energy for Tomorrow Conference sponsored by the New York Times last week, said the evidence of climatic change is mounting and showing more rapid progression while stating electric cars have the power to wean our vehicles off imported oil. An article by Ben Geman on The Hill, also quoted Secretary Chu as noting rising sea levels. “It is rising even faster than we thought,” he said. The Energy Czar pointed out the increase in violent rainstorms proceeding at a pace beyond anyone’s expectations. He continued to say the debate is over how quickly the climate will change. Despite evidence that is to some degree contradictory, the answer is probably sooner than we think. In 2007, reports from various environmental watchdog groups reported the increase of violent storms and extreme weather events. This is alleged to be the result of greenhouse gasses in the atmosphere, which stores more of the sun’s energy. This has the tendency to create extreme condition in both terms of heat versus cold as well as rain versus drought. Whatever weather results it tends to be more extreme in its level. The unprecedented force levels of recent tornado events underscore this fact. Another post by Steve Gelsi of MarketWatch, details Secretary Chu’s belief in the future of electric cars, despite a marketplace slow to accept them. He is convinced they have the power to cure our thirst for foreign oil. The result of that would be positive not only for the environment but the economy as well. Granted the combustion engine is rapidly evolving but all the newer high-mileage and clean diesel vehicles still use petrol. This is merely a stopgap measure if the population continues to grow and more people don’t begin to choose cars that use no fossil fuels at all – not just ones that use those fuels more efficiently. MarketWatch reported that Steve Nadel of the American Council for an Energy-Efficient Economy stated electric vehicles have been held back by a higher price, but expects the technology to win in the long run. None of the electric cars on the market last year met their sales goals. 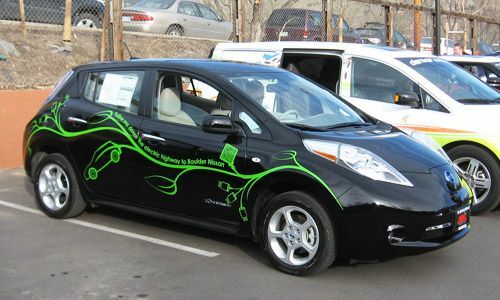 During 2010, production of the Nissan Leaf was hampered by the earthquake and tsunami in Japan, while the Chevy Volt was plagued by exaggerated hazard reports. Fisker has its own problems, including the disastrous performance of the model loaned to Consumer Reports. Tesla’s success with the Model S is not year clear, while the company is reportedly years away from making a profit. Nevertheless, in the early 1900s, when Henry Ford was trying to sell the virtues of the combustion engine over the expensive electric cars of the day, it took a while for the roadways to be built that gave it an advantage. Today’s electric cars are waiting for the corresponding network of charging stations to be built before the advantages of the electric car will become clearer That grid is rapidly expanding. A parking garage in a Denver Hotel now has a row of charging stations and the Museum of Nature and Science has just installed one. Denver is the backwater of the electric car market so if it’s happening here, it’s happening everywhere – with the possible exception of the oil producing states of the plains. Buyers of electric cars today are taking positive action to improve the environment as well as the economy and just maybe the globe’s international relations. Blessed be the early adopters. Chu knows about as much about climate science as the IPCC. Meaning nothing but politics and how they are involved in it. Anyone who's bothered reading actual scientific debate on the subject knows that (hugely inaccurate) computer models aside, there is a huge amount of conjecture and debate about what is or isn't "climate change" and what really is the cause (or causes). On the other hand, getting off of petroleum as our main and only energy source has a host of other good reasons to support the idea as a goal.